Arizona is home to the sunniest cities in the country and the sun that shines over the desert can be harsh on a person’s skin. Though the summer heat and humidity is being to give us a reprieve it still doesn’t give us an excuse to not take measures to protect our skin when spending time outdoors. 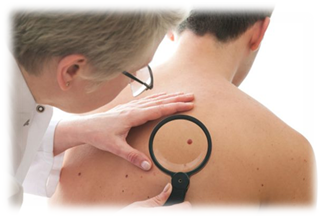 Skin cancer generally shows itself on a person through skin moles. Our skin is the largest organ in the body. Weighing around 6 lbs, it receives a good percentage of blood and water. It’s function varies from (1) serves as the receptor site for us to feel different sensations, (2) regulates our body temperature (3) secretes wastes and other beneficial elements such as sebum, and (4) protects us from external agents and UV rays of the sun. One of the common disorders of the skin is moles. The term disorder can be alarming although we cannot argue with the fact that certain people made moles gorgeously popular: Marilyn Monroe and Cindy Crawford for example. These indifferences in the skin are produced by melanocyte grouping during the first years of our existence. Melanocytes are the cells in our body that produces the pigment responsible for skin color called melanin. They come in different size and appearance: some elevated, some with hair. On the other side, moles can be the first indicators of skin cancer. This is why we, at Complete Care Medicine, highly encourage everyone to visit a physician routinely for an assessment if there are any concerns about skin abnormalities. A – Asymmetry. This particularly focuses on the shape of the mole. Irregular shapes are red flags. Benign moles are typically round or oval and smaller than the size of the eraser of pencils. B – Border. Moles with jagged, irregular, rough or scalloped margins should be checked. Benign moles have distinct edge. It marks the separation of the mole to the skin. C – Color. Check for uneven color distribution. Melanoma can also be manifested by moles with multiple combinations of colors. D – Diameter. A growth of mole bigger than 6 millimeters (tip of pencil eraser) should be evaluated. E – Evolution. The number of moles varies from one person to person. Pigmentation due to aging happens therefore new moles can appear or fade. Transformation of moles is possible overtime. But changes in color, size and shape should be observed closely. Cancerous moles can also be itchy or prone to bleeding. Although summer is indeed for outdoor activity and family fun, we should never forget to take good care of body’s skin. Here are some tips on how we can prevent skin cancer. a. Avoid getting sunburns, stay away from tanning (both natural and artificial), and stay on shaded areas when it’s the sun’s peak time: between 10 in the morning and 4 in the afternoon. This advice is for newborns as well! We understand that sunlight can help cure jaundice but please do not expose them between these times. b. Yes, the previous advice can be ridiculous especially if you love playing daytime sports but please provide additional protection by using sunglasses and covering up with clothes. Installing tints on car windows and shields will also be beneficial. c.	Apply broad spectrum sunscreens with SPFs 15 or more accordingly. It is worthwhile to use SPF 15 it daily. If you are highly active, make sure to utilize SPF 30 or more. Choose water-resistant sunscreens so sweat would not be stripping it off from you easily and do not forget to reapply every two hours. Visit us for your yearly mole screening especially after reaching your 30th birthday. As previously explained, changes normally happen but we have to detect whether it is normal or not. You do not have to wait nonetheless if you experience irritation, burning sensation and infection on your moles. Experts at Complete Care Medicine will conduct a health history assessment and check your skin from head to toe. Our skilled doctors may conduct minor skin biopsies in the clinic to confirm diagnosis of malignant moles if needed. Our skin care and dermatology services also offer health educations to clients as well so they can discover more ways on how to take good care of the largest organ in our body. This includes lessons on how you can get the perfect sunscreen from the wide array of choices available in the market. Remember, early diagnosis leads to a better prognosis. The yearly assessment of moles is important so we can detect problems and prevent it from getting worse. This routine exam is not limited to detection; it also allows us to take action if cancer is confirmed. Delaying your skin evaluation will definitely NOT save you more money. Call or visit the Complete Care Medicine family doctors in Gilbert AZ for a complete skin evaluation.